We usually don’t think twice before going out for Chinese food or ordering takeout. The common misconception is that it is a bit tedious to cook it at home as there are a number of ingredients involved. 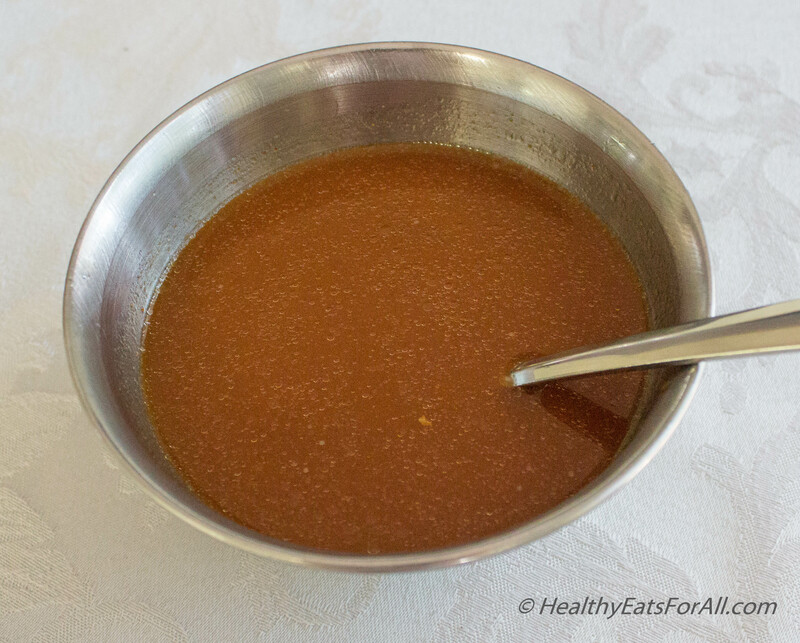 But once you have the main sauces in your pantry, it’s just a matter of getting the protein and a few veggies. Increasingly I’m seeing that people do prefer to cook it at home. It could be due to food allergies or wishing to have more control over the quality of ingredients. For me it is a mix of both! I have close family members and friends whose kids have egg and peanut allergies; plus I prefer to use organic ingredients. 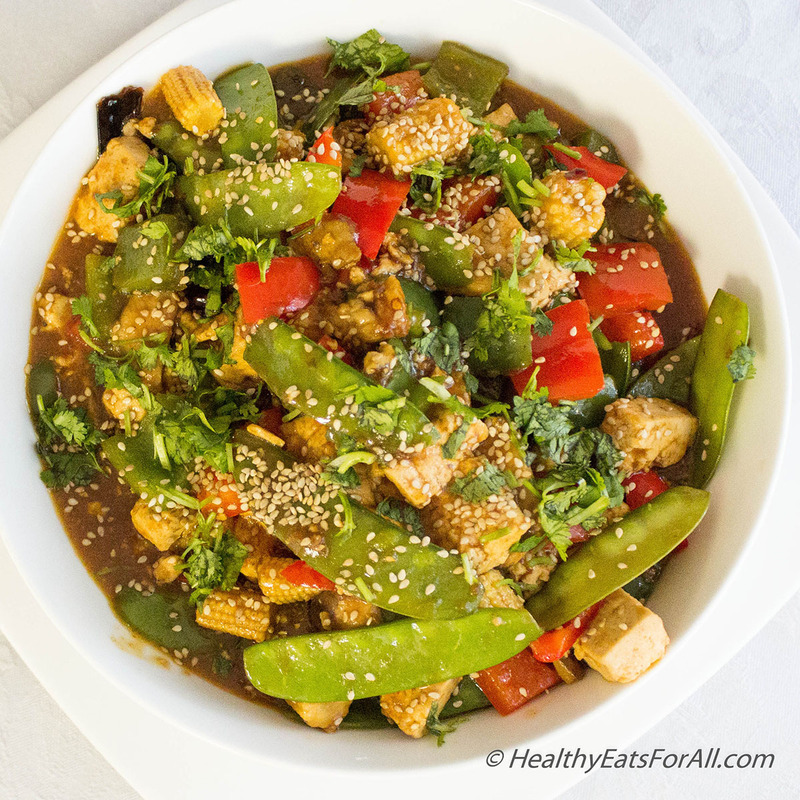 Ever since my younger daughter quit eating chicken/turkey, this is her favorite go to vegetarian Chinese dish at home! 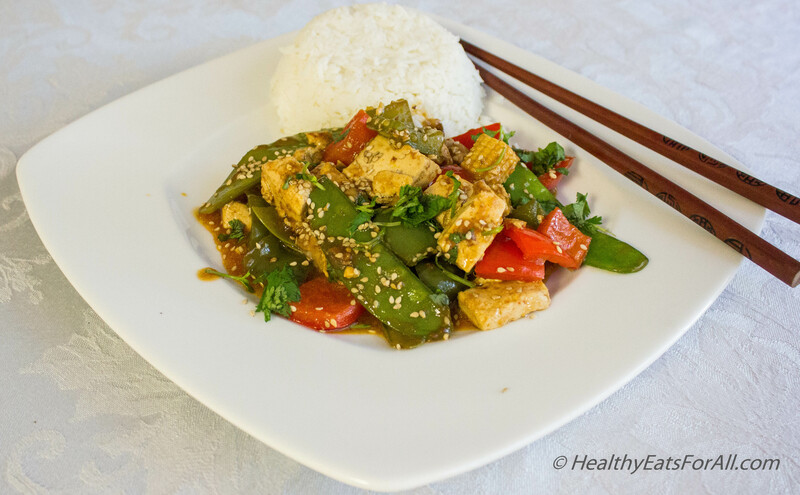 So here is my version of the Spicy Hunan Tofu. 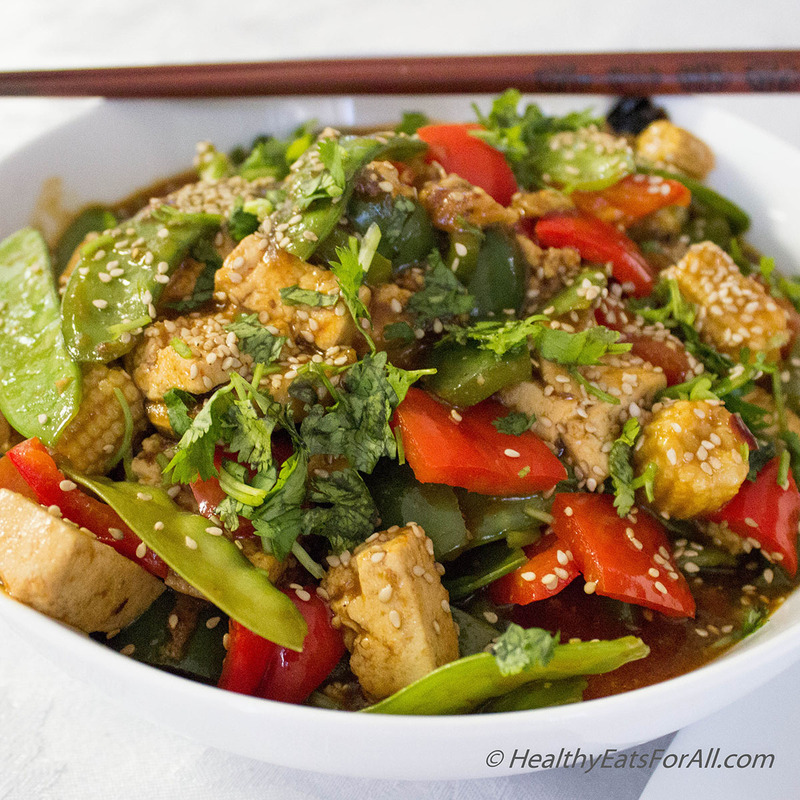 The tofu in this dish can be substituted by chicken also. 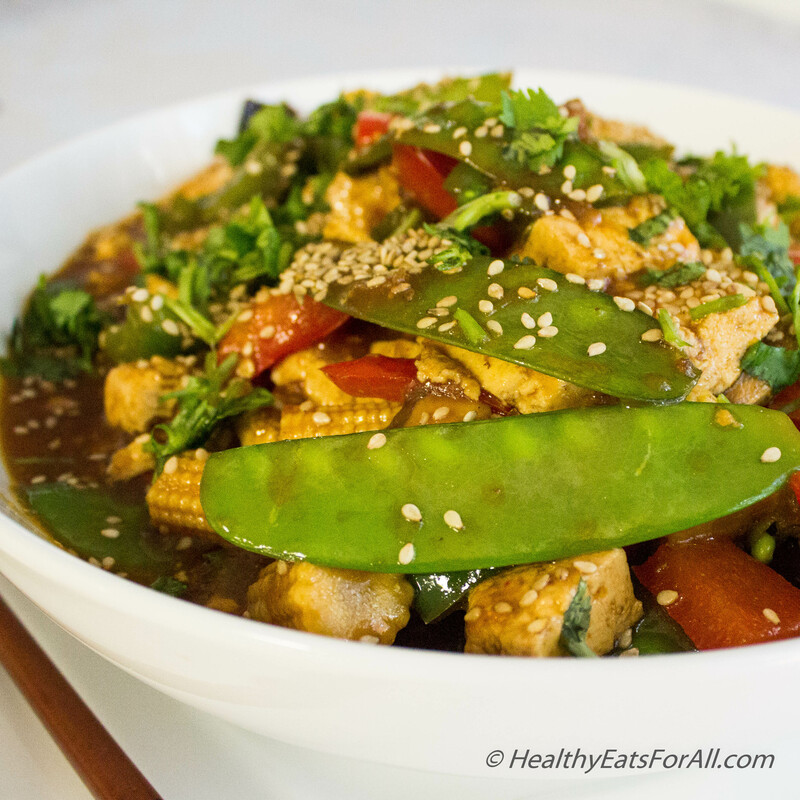 This dish can be fairly versatile; you can switch some veggies of your choice or based on whatever is available. The best way to approach this recipe would be cut up all veggies and protein, and measure out all the other ingredients for quick cooking. That way this dish can be made in no time! First drain all the liquid from the Tofu and pat it dry. 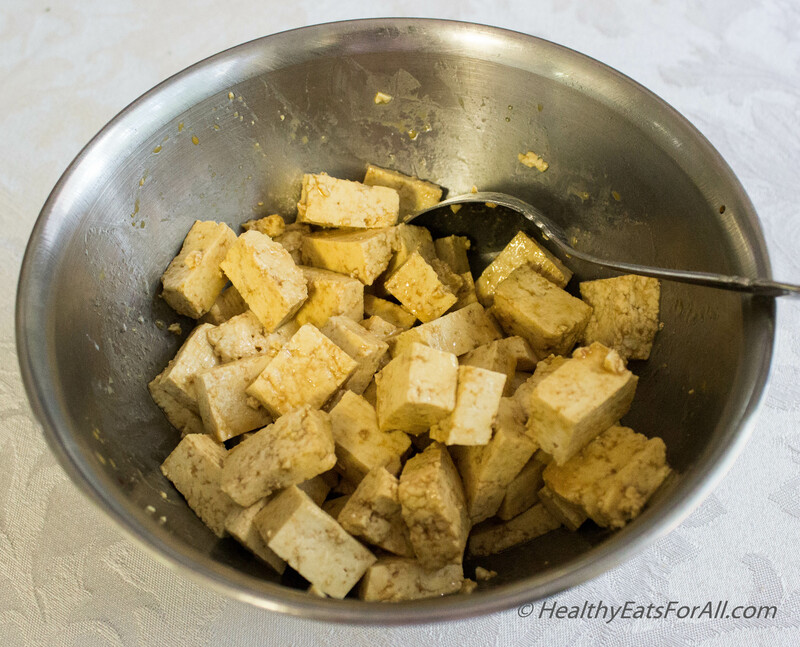 Then mix all the ingredients of the marinade and add the diced tofu/chicken. Place in refrigerator 30 minutes before cooking. Combine all the ingredients of the sauce and set aside. Heat about 1 tablespoon of oil in a large skillet over medium heat. 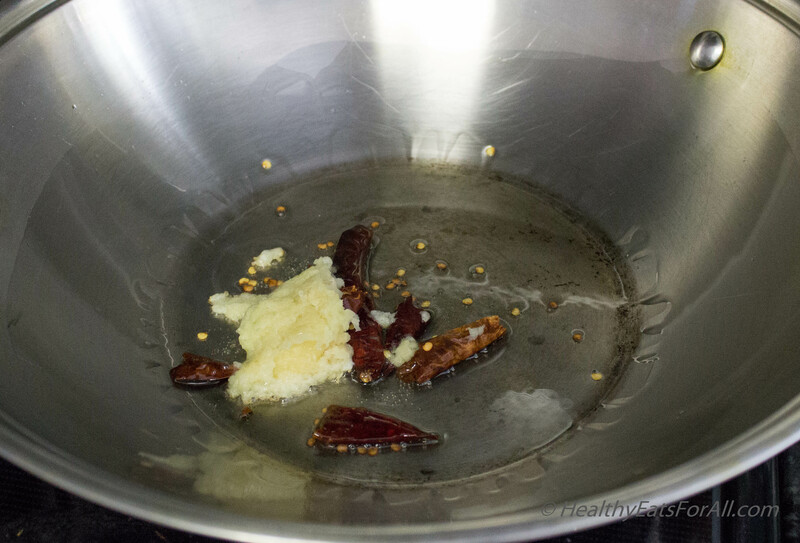 Sauté ginger, garlic, and whole red chili pieces. Stir until fragrant. 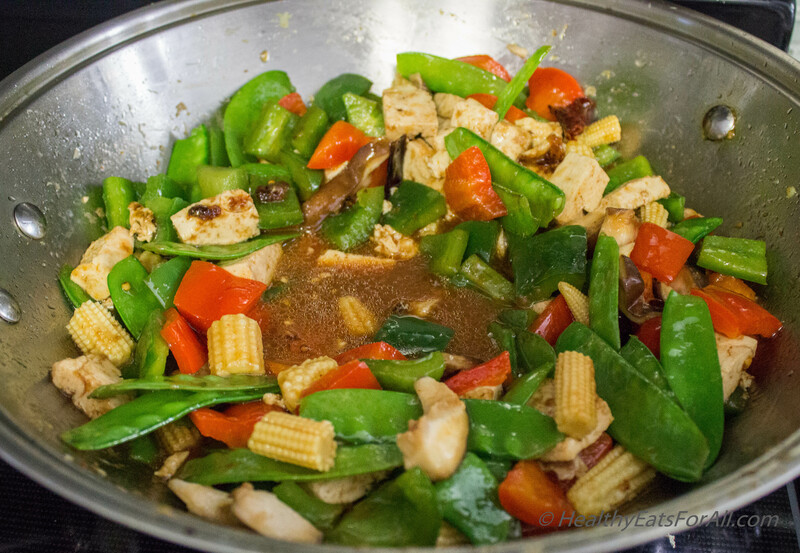 Add red bell peppers, green bell peppers, snow peas, baby corn and cook for about 3 minutes. Veggies should remain crisp. 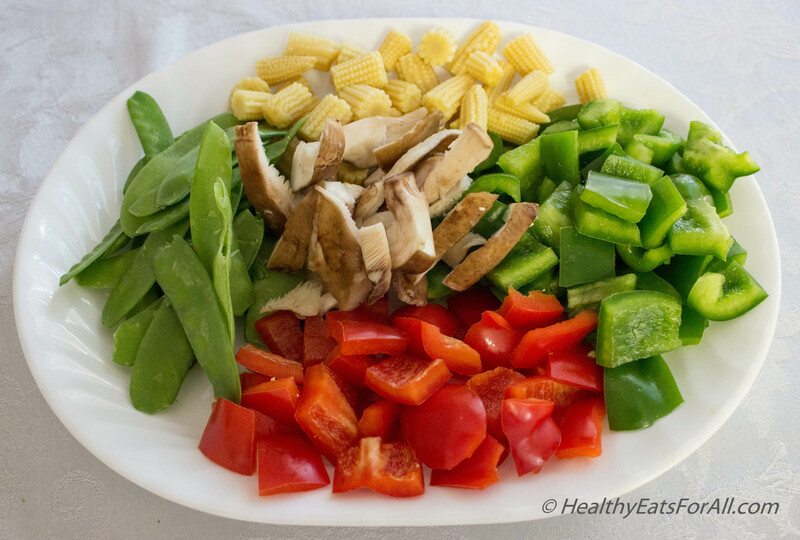 Take all the veggies and set aside in a separate bowl. 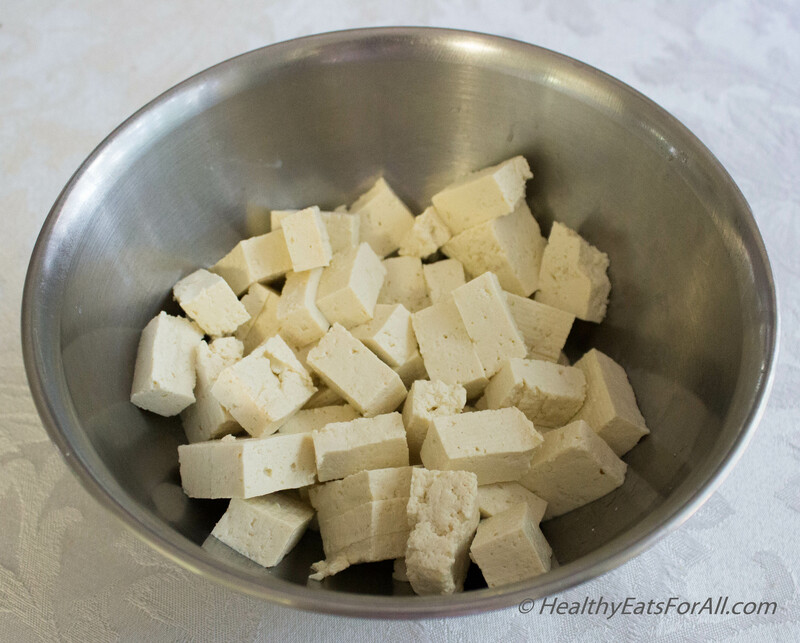 In the same pan, add a little bit of oil, sauté the tofu/chicken. 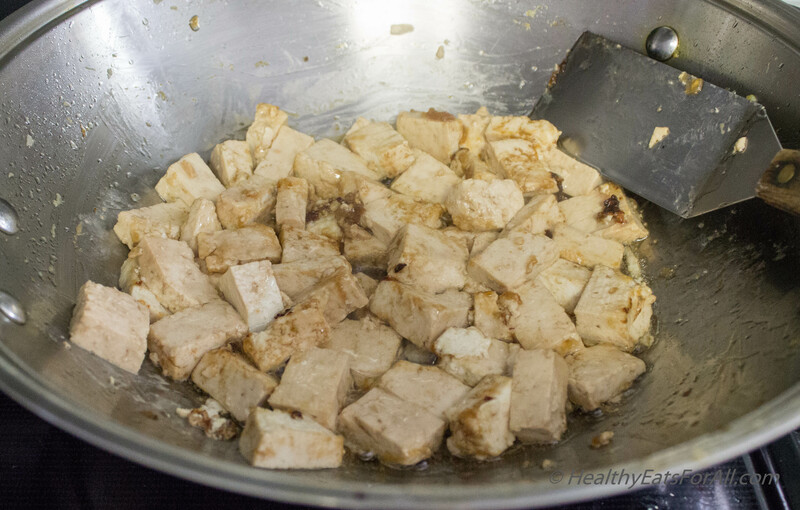 Once tofu/chicken is cooked, add the sauce to the pan and stir for a bit. 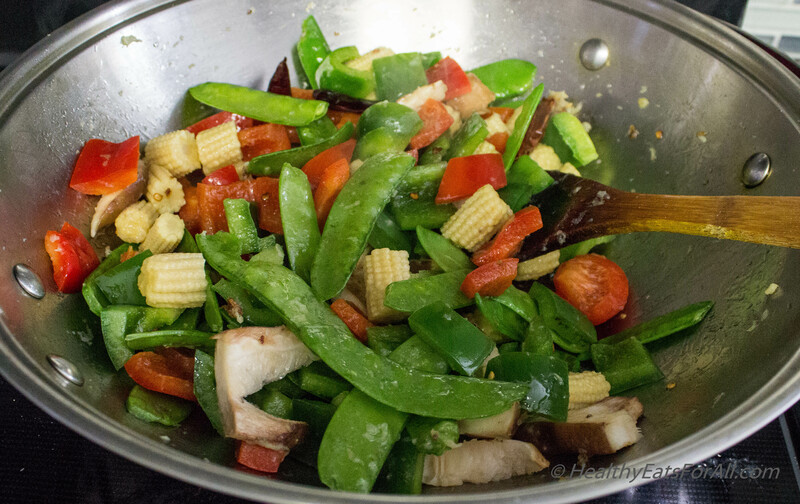 Add the vegetable mix and stir to coat. Adjust the seasonings. Cook a couple more minutes and sprinkle on cilantro and sesame seeds. 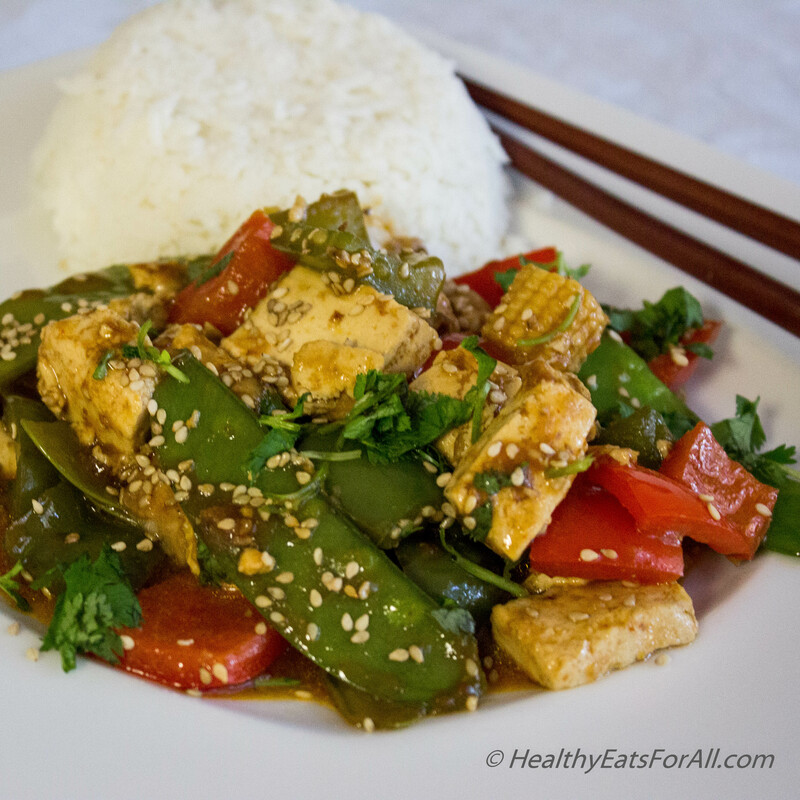 Serve with rice or noodles. Enjoy!